Can't Get Enough Futurama (commonly abbreviated CGEF) is one of the oldest Futurama dedicated news sites, as well as a knowledge bank of Futurama from early on. CGEF is probably the most reliable site for Futurama news, and have been reported anything from trivia to large-scale changes since 2001. 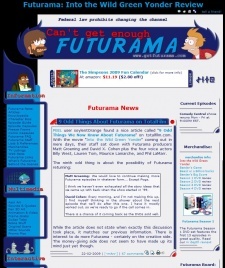 The site also publishes interviews with Futurama staff, professional reviews and contests, and allows anonymous reviewing of episodes. CGEF also created the successful Futurama message board Planet Express Employee Lounge. This page was last edited on 25 February 2014, at 21:48.